It is November 11th - Remembrance Day in Canada. I'm at work on my break and thinking of everything that has happened this week. The flooding was begun at Muskrat Falls and it is clear we were lied to again by NALCOR and our government as it is higher than it was supposed to be. We were offered a compromise and we took it in good faith and they have reneged on that promise. A sociopath has taken control of America with at least some of them blessing the change. This is truly frightening. I went to see a orthopedic surgeon about having a hip replacement and he completely dismissed what I was saying and what other orthopedic surgeons had said and declared that I don't need one yet and maybe not at all. Instead, against my wishes, when I was confused and vulnerable he gave me a steroid shot. My face is now a vivid red - two days later - I am uncomfortable and of course still have a sore hip. The night of the election, restless and worried, I kept reading Bird by Bird by Anne Lamott. I've read it a gazillion times and I usually read it when I need cheering during the writing process. She is so sane and generous and funny - all of my favorite attributes. Even through all of this I have kept writing on my two projects for NaNoWriMo. I've written in my disappointment, my anger, my grief. It has all come out and it enhances the work I'm doing. As a Buddhist I understand the suggestion that we take it all to the cushion - an offering of our wounded messed-up stuff. It is the offering the Dralas (protective spirits - sort of) like to receive because it is given whole-heartedly. I believe our art is the same. I will dance me to the end of time. This week has SUCKED!!!! Understatement of the century. First our septic tank stopped working last Friday..no toilets, sinks, or shower for 24 hours. NOT fun. Then our furnace stopped working on Election Day. It was a cold, miserable Election Night that I won't forget as long as I live. I slept four hours and cried most of the day. I was in utter shock and mourning for my country as I know it. Now my mother-in-law is gloating--she's a Trump supporter. So I'm trying to figure out how I'll get through Thanksgiving if politics has to be part of the discussion. Half the country didn't vote. Half of half voted for Hillary and the other half of half voted for Trump. Hillary technically won more votes but our Electoral College is set up to make sure people in rural areas get as equal a say as those in urban, more progressive areas. And that, in a nutshell, is why he won--Bubba is tired of his voice not being heard. And, in a way, I can see his point--I just wish it could have been made with a leader who isn't a Nationalist. It has been a very, very hard week, Jan. I'm so sorry to hear about what happened at your medical appointment; it's disheartening to be waved aside like that. And the rest...so, so hard. I like your idea of weaving that pain and grief into what we do and offering it. And in that, I think we free ourselves. Cohen was a sad loss, but he had a decently long life considering. It took me a few years to appreciate his music. 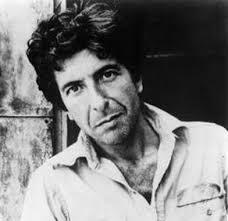 My wife, who is not much of a fan of the pop music scene, actually liked Cohen's music and he was among her favorite pop artists. That's saying quite a bit considering that what she mostly listens to is Christian music. She liked Cohen's voice and his songs--especially "Everybody Knows"--she loves that song.